How an engineer uses a vacuum pump can either make their job easier or more problematic. As such, it’s important to ensure that when carrying out freon recovery, there is clear access to the pump. However, some engineers may experience problems when using a HVAC or AC vacuum pump, which in turn means that any form of recovery takes more time. Genuine equipment faults can arise from time to time, however it’s also not uncommon for faults to arise due to human error and who aren’t fully-versed on the properties of the vacuum. For example, it’s understandable why some would assume that a large vacuum pump is required for a big job, but this isn’t always the case. 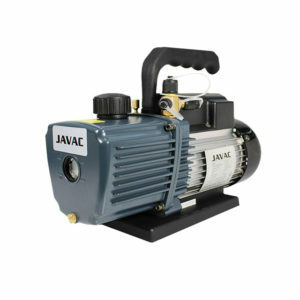 In many instances, a properly connected AC vacuum pump that is well maintained will carry out the job just as effectively. Another common misconception is that a larger vacuum pump will be faster when dehydrating, but if it’s not suitable for the application, then this is rarely the case. Fortunately, you can limit these occurrences by ensuring the pump is well maintained and used in the right way. As using the wrong type of HVAC vacuum pump will mean that the job is made harder than it needs to be, an engineer needs to ensure that they are using the right type of pump from the start. As advised, the size of the pump shouldn’t be the determining factor when choosing, but rather the swept volume. In layman’s terms, this refers to the amount of free air that the AC vacuum pump can free up within a set time. To ascertain the best vacuum the pump will achieve, engineers should instead look at the depth of the HVAC vacuum pump. It’s also important to ensure that the pump being used has been crafted by a reputable manufacturer. It’s understandable that a company wants to ensure costs are kept low whenever possible, but this doesn’t mean a professional should rely on equipment that has little recognition in the industry. When purchasing a HVAC vacuum pump, there will be some factors to consider, so prices will vary. However, a product that’s being offered for a low price without a reputation can mean that you’re effectively taking a gamble. Relying on professional manufacturers ensures that you’re not left with an AC vacuum pump that ceases to work after a few uses, nor are you having to constantly invest in repairing the pump. As well as cheaper pumps being less reliable than professional models, there is also the fact that vacuum itself may not be as good as that seen on premium vacuum pumps. However, if you’re using a HVAC vacuum pump that’s recommended and still having issues, then it could be due to the way it’s being used. In small confined spaces, an engineer should only use a short hose, albeit with a large diameter. This ensures that the vacuum doesn’t lose traction, and is more effective and faster as a result. Although a good quality pump can be relied upon, regular maintenance is still important. Although the HVAC or AC vacuum pump will not break down, the performance could be affected drastically. One of the most common reasons for this is because water has become condensed in the oil. Not checking the oil will mean that the vacuum pump has difficulty performing its role. It’s important that the gas ballast valve is opened during the early stages of an evacuation, as this is what helps separate the oil from the water. This ensures that water doesn’t condense in the pump. It can also be beneficial to use an electronic vacuum gauge, as this gives more information than that of a Torr gauge. The use of a Torr gauge relies on a pressure rise test and pump running time, which while practical, does depend on the experience and skill set of the engineer. Engineers that use a Pirani or digital don’t have to rely on a pressure rise test, which means more accurate readings can be achieved easily. To get the full benefit from a vacuum gauge, it needs to be placed away from the pump inlet, as this is where the best vacuums are achieved, so the further away from the pump it’s fitted, the better. However, you still need to ensure that the gauge can perform its duty while in operation. Regardless of whether you have any issues with a vacuum pump, it can be useful to check over the pump every couple of weeks. One of the most important aspects of carrying out maintenance on your pump will be checking that there is enough oil. Checking the oil can be easy to overlook, but could be detrimental in the long run, especially if the pump is running on a regular basis. Engineers should also take the time to ensure that any refrigerant is completely removed. If left it could freeze within the pump, which will also lift the oil. If the pump was to have a seizure because of this, then it could mean that the warranty is invalidated. This can mean that the company must invest in more repairs, or a completely new vacuum pump. Taking the time to ensure the right pump is being used and ensuring it is maintained on a regular basis will ensure that the equipment is able to function without hindrance for the foreseeable future.